Thousands of commuters across London will be preparing to leave work early tonight as a 24-hour tube strike hits the capital. With many workers taking leave or working from home tomorrow, it just goes to show how much we have now come to rely on public transport. With people relying so heavily on trains to get around we thought it was time to mix it up and have compiled a list of our top 5 alternative shared modes of transport that you and your colleagues could use to get to work! This vehicle seats four passengers and is powered by each passenger pushing and pulling on the different handles to generate speed. Although it may not look much the Humancar can reach up to 60 mph going downhill! However, you may notice that there is no steering and to turn the passengers must simply lean left or right. Although it is not the safest mode of transport it’s free to run and it will give you a work out as well as a means to get from A to B! 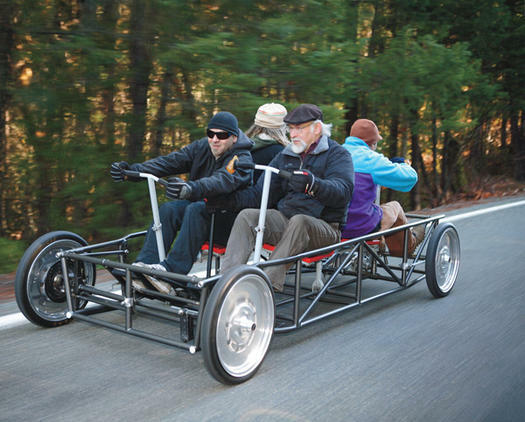 This is a shared bike that can sit up to 18 passengers and is pedal powered. A bar sits in the middle of the bike and over 30 litres of beer is provided. These bikes are situated in numerous cities across the world and are great fun for someone’s birthday or stag do. It could also be a great way to get to work, provided you can still stand when you arrive! 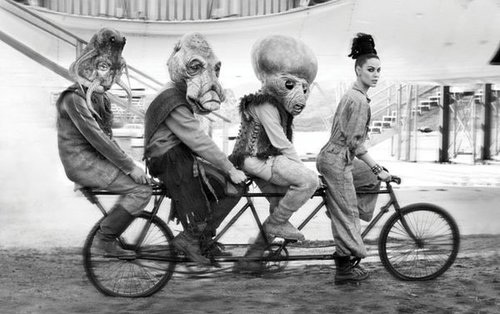 If the beer bike seems a bit too much effort then why not go for a more relaxing way to travel. As you may have guessed this mode of transport is simply a pedal powered sofa on wheels. A great alternative to those uncomfortable bike seats, the bike is the perfect combination of lazy and productive. You could even cycle this straight up to your desk and work from it without ever having to get up. To avoid time walking down hills or steep inclines the toboggan sled is a great way to both save time and have fun! There is a sled ride in the city of Funchal, Madeira where two men dressed all in white take passengers up and down a long hill. This ride is loved by tourists and is used by locals as a quick way to get around. Perhaps it’s time to start installing stops around the capital as an alternative to the tube and Boris bikes! The oldest shared mode of transport in our list, the tandem bicycle dates back to the 1890’s and is essentially a bicycle designed to be ridden by more than one person. They avoid the problem of keeping pace or catching up with one another if you are out as a group and if you fancy a rest you can lazily ease up on the pedalling and let the others carry you. A great way for you and all your colleagues to get to work together ensuring that no one is ever left behind. If you are fed up with the more mundane modes of transport then why not use Shareagift to save with friends or colleagues towards new and alternative modes of transport. Alternatively you could come up with you own new mode of transport and fund it through Shareagift. Remember, Shareagift can help you raise cash for anything and everything!